Yu-Gi-Oh! TCG Strategy Articles » Shadows in Valhalla – 1st Look! Home > Beginner Tips, Special, What's New? > Shadows in Valhalla – 1st Look! Shadows in Valhalla – 1st Look! We’re very close to the release date for Shadows in Valhalla, the 60-card, all-foil set that brings Zigfried von Schroeder’s long-awaited Valkyries to your Deck! If you’ve never watched the Valkyries in action in the KC Grand Prix, you can check out Zigfried’s Duel against Joey Wheeler here and here! Be sure and check out some of Zigfried’s other Duels, too, including his ultimate showdown against Kaiba. Neither player can activate cards or effects in response to this card’s activation. Cannot be activated as Chain Link 2 or higher. 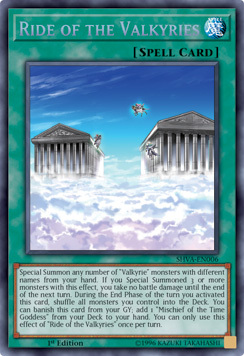 At the end of your Battle Phase, if all monsters you control are “Valkyrie” monsters (min. 1): Send this card to the GY, also, immediately after this effect resolves, skip to the start of the Battle Phase of your next turn. If you do, you cannot activate “Mischief of the Time Goddess” until the end of that turn. Just like on TV, if you have Valkyries on the field – and only Valkyries – at the end of your Battle Phase, you can fast-forward the game to the start of your next turn’s Battle Phase. Skipping your opponent’s turn entirely. Special Summon any number of “Valkyrie” monsters with different names from your hand. If you Special Summoned 3 or more monsters with this effect, you take no battle damage until the end of the next turn. During the End Phase of the turn you activated this card, shuffle all monsters you control into the Deck. 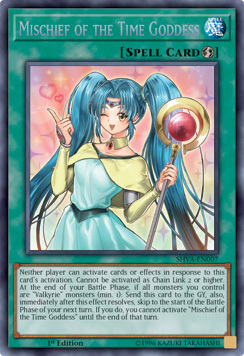 You can banish this card from your GY; add 1 “Mischief of the Time Goddess” from your Deck to your hand. You can only use this effect of “Ride of the Valkyries” once per turn. Ride of the Valkyries Special Summons your Valkyries from your hand. The drawback is that they return to the Deck during the End Phase of that turn. But only that turn. So if you SKIP the End Phase of that turn, by using Mischief of the Time Goddess to fast-forward the game to your next turn, then your Valkyries remain on the field. Permanently. 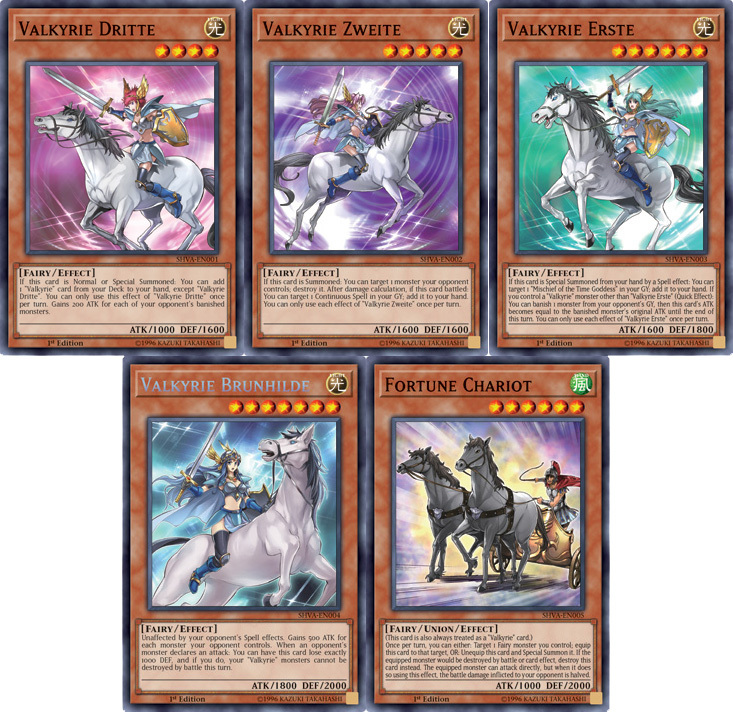 Here are the 4 (no, make that 5) new Valkyries that come in the set. Some of their effects have also been upgraded from the TV versions. If this card is Normal or Special Summoned: You can add 1 “Valkyrie” card from your Deck to your hand, except “Valkyrie Dritte”. You can only use this effect of “Valkyrie Dritte” once per turn. Gains 200 ATK for each of your opponent’s banished monsters. If this card is Summoned: You can target 1 monster your opponent controls; destroy it. After damage calculation, if this card battled: You can target 1 Continuous Spell in your GY; add it to your hand. You can only use each effect of “Valkyrie Zweite” once per turn. If this card is Special Summoned from your hand by a Spell effect: You can target 1 “Mischief of the Time Goddess” in your GY; add it to your hand. If you control a “Valkyrie” monster other than “Valkyrie Erste” (Quick Effect): You can banish 1 monster from your opponent’s GY, then this card’s ATK becomes equal to the banished monster’s original ATK until the end of this turn. You can only use each effect of “Valkyrie Erste” once per turn. Unaffected by your opponent’s Spell effects. Gains 500 ATK for each monster your opponent controls. When an opponent’s monster declares an attack: You can have this card lose exactly 1000 DEF, and if you do, your “Valkyrie” monsters cannot be destroyed by battle this turn. These effects speak for themselves, but check back tomorrow to see Zigfried’s Continuous Spell Cards in action: Skuld, Verdande, and Urd, which give you power over the cards in your opponent’s Deck!